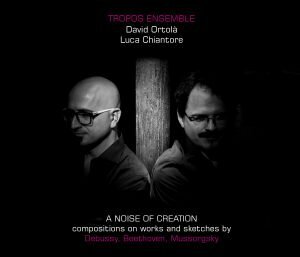 Working alongside David Ortolá in our Tropos Ensemble project is, by a long chalk, the artistic adventure of my life. Since 2012, when we started to give it shape amidst the chain reaction started by the 20 años 20 pianos concert (July 2, 2011), not a day has passed without my activities somehow linking to what our Tropos Ensemble represents. It came from a very simple idea, and not a particularly original one: to overlay new material on performances of extant classical works. The plan was for me to play pieces that all of us are more or less familiar with, while David creates new layers of sound creating a dialogue between the old and the new. Over time, however, the project has found its own pathways. Now we don’t quite know who composes and who only interprets, nor where the written material ends or where the improvisation begins; the piano has ceased to be our exclusive starting point, and the electronic reworking of sound we decided to apply to our first album, A Noise of Creation, has now worked its way into our live shows and has inspired decisions which were certainly not in the initial script. What was originally just a simple intuitive spark has increasingly become the axis of this whole story: sounding out the spaces in which the line between composition and performance blurs or breaks. Applying leverage to the incoherences of a system that has artificially generated diametrically-opposed capacities and spheres of action between the creators of works and those charged with presenting them to audiences—this is what we are trying to do through Tropos. And we want this troposal to go on finding the same anarchic joy long into the unforeseeable future. Musicological research can prove an unparalleled stimulus for bringing ideas to performance. But I have long been aware that performance can just as easily feed back to musicological thinking. And this is not all. Very often these synergies reveal no clear unidirectional trajectory. I experience this fertile collision with growing interest, in particular because of its potential to reshape our historiographic, stylistic, and professional categories. With this in mind, in the summer of 2018 I launched this new personal project, currently designed for a two-year period: concerts, talks, and other initiatives, some addressed to an academic environment, others to general audiences, the common thread being my yearning to offer alternative ways to perform the classical-music repertoire from a starting point of unconventional musicology-based approaches.